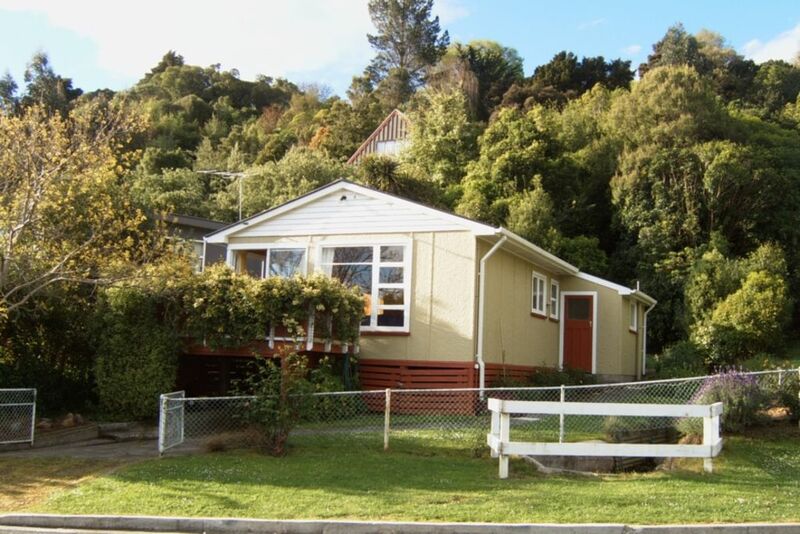 A tidy and well-maintained kiwi holiday home in a quiet street, sited on a flat section with some bush. A short stroll to the beach, cafes and shops, and well located for exploring Akaroa and the neighbouring bays, close to scenic and historic walking tracks around Akaroa. Also nearby wharf, bike and skateboard park, mini golf and playground are just a few minutes away by foot. The bach has an open plan kitchen / dining / living area and three bedrooms. Bedroom 1 has a queen bed, bedroom 2 has a double bed and the small bedroom 3 has a set of bunks and a single. It sleeps 6. On street parking for car and boat available. Amenities: Broadband internet, log burner, fridge/freezer, microwave, washing machine, dryer, DVD player, deck. A small stream meanders through the property. Although the stream is only ankle-deep, caution is advised with small children. Typically, a minimum booking of 2 nights for weekends, 3 nights for long weekends. Last minute discount does not apply for long weekends or school holidays. This place won't be for everyone. It is very rough round the edges and there are hints of damp and mold in the air on occaision, a luxury stay it is not! But, the beds are comfortable and our budget conscious family of five enjoyed our time here. The location is perfect, steps from the town, beach and trail heads. The tree by the deck is filled with birds and their antics (one even came inside), and the kitchen has all you need. The place was perfect for our needs. It was central, quiet and clean. Lovely clean and quiet house. Handy to shops and cafes. Would definitely recommend and re visit myself. Lovely stay- clean, homely house with everything we wanted available. Many thanks. We had a great time and would definitely book this house again. Good collection of toys and movies to keep the kids entertained! Good collection of toys and movies to keep the kids entertained! Not a stunning, scenic location but very handy to town and has everything you need to stay comfortable.